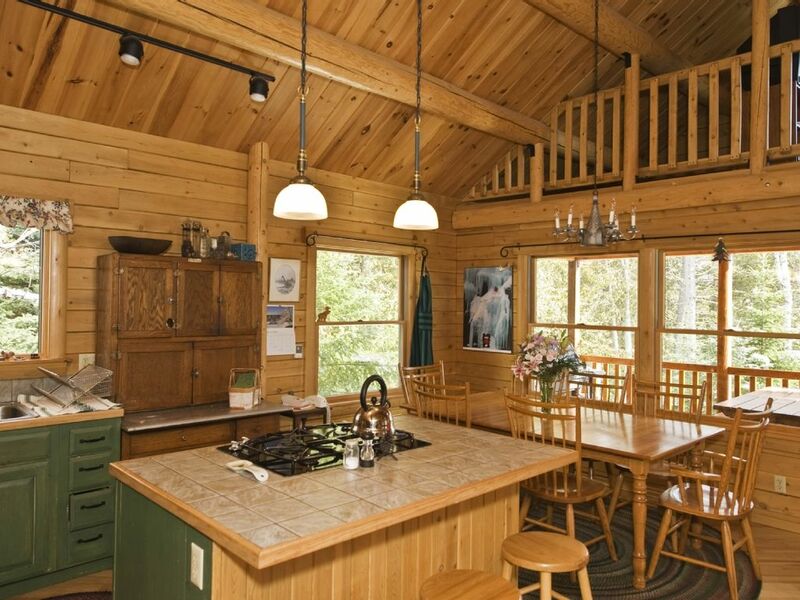 Exclusive, immaculate, four-season, log cabin on motor-free Saddleback Lake. Five acres of pure privacy with 1,000 feet of private shorefront including your own private beach. Awesome views of Saddleback Mountain. Free use of our two kayaks and two canoes. Saddleback Lake warms up nicely and is a great swimming lake. Awesome wildlife: loons, moose, owls, and deer. Easy hiking trails right from the cabin - Saddleback Mountain and hiking trails to the Appalachian Trail are only 10 minutes away! * Three bedrooms with queen-size bed in each of two downstairs bedrooms (new mattresses) and three twins in the upstairs bedroom. Strictly limited to 7, please. * 2 canoes and 2 kayaks on premises for your exclusive use. * More canoes, row boats, & large swimming beach across the cove at Saddleback Lake Lodge. Rangeley is a true 4-season resort area. One of the few places that has it all, mountains, lakes and forests. Wildlife abounds around Saddleback Lake and it is just the perfect place to spend some quality family time. Your quintessential Maine experience. Hundreds of great titles to choose from. 2 canoes and 2 kayaks. Full size and junior size. Across the cove-down the driveway- there are 2-tennis courts for your free use. Check out Evergreen a the top of Dallas Hill or go into town for Mingo Springs. 2 canoes & 2 Kayaks available for your private use. Hiking and cross country trails all the way around lake and up to the mountain are available from our back and side yard!, Tennis courts at Saddleback Lake Lodge (a short walk away) Also more canoes and row boats you can use at Saddleback Lake Lodge. What an escape! This was a perfect getaway - beautifully furnished, cozy and comfortable cabin, in a secluded setting on a pristine lake! Owners were very easy to work with / accommodating. We fished, swam, hiked. played board games and football...this place was so well stocked with books, games, movies, tennis rackets, canoe/kayak. So many indoor and outdoor activities for kids and adults alike - nobody wanted to leave!! We made some great family memories, love the Rangely area, and will definitely be back! We loved our week at Loon's Song on Saddleback. The setting was gorgeous, the lake was tranquil and the fishing was surprisingly good for August. The cabin was comfortable for 5 people, the canoes and kayaks were lots of fun, and the surrounding mountains, rivers and waterfalls were great to explore on day outings. The kids were a bit concerned about the leeches in the lake - they did not want to swim as a result. I swam an hour a day and paddle boarded without any issues. We had to take the kids to Rangeley Lake and Small's Falls for swimming. We all agreed that cutting down a few trees to give the house a better water view would be a worthwhile effort as well. The lack of motorboats on the lake was wonderful for swimming and peaceful evening kayaks. We would definitely come here again. We have stayed at this cabin for a few years now and it just gets better and better! We love the privacy of the cabin and the ability to also enjoy the Saddleback Lake Lodge tennis courts and beach. The cabin is clean, well-equipped and roomy with several options to curl up in your own space to read that summer book. The wrap-around porch and deck are perfect for sitting in the sun or shade and to watch the birds and even deer pass through the property. A short stroll through the woods takes you to the lakefront where you can paddle in the canoes or kayaks to watch the loons. We hope to continue visiting this beautiful area for years to come. We had an amazing stay. The cabin was beautiful and had everything we needed for our stay. The cabin was very secluded and quiet and we spent a long relaxing weekend fishing, canoeing, having campfires, enjoying nature and the beautiful lake/scenery. Would definitely recommend and can't wait to go back! Although the weather was a bit rainy and chilly, we still had a great time. Great place to spend with family, play some older games and just sit back and relax. Wonderful log cabin, the stuff dreams are made of ! Truly stunning place, wonderful cabin, log fire was epic, enjoyed cooking on the outdoor fire pit, we hiked the Saddleback Mountain trail which was challenging but well worth the rewards ! Kayaked, fished, walked, ran and played games with the family, cooked s'mores on the open fire. ! What a place !!!! Best Off Mountain Vacation Home Rental. Our cancellation policy is as follows: First - if we re-rent the cabin then you get your money back. If you cancel 30 days or more before your rental and we can't re-rent your week, we keep half of your deposit. If you cancel less than 30 days and we can't re-rent your week then you are still responsible for the rent.